Optum 360's new spiral bound version of ICD-10-PCS! Official code book sets the standard for coding accuracy which is the cornerstone of health care analytics and revenue cycle management. Now in spiral bound format! The complete 2019 ICD-10-PCS code set by your side. 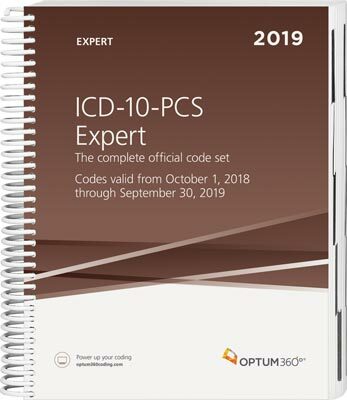 The ICD-10-PCS Expert is Optum's spiral bound version of ICD-10-PCS with snap tabs to allow faster referencing of procedural terms in the index and sections in the tabular. Itcontains the complete ICD-10-PCS code set and all of the supplementary appendixes required for reporting of inpatient procedures. In addition you will find the familiar Optum360 coding and reimbursement alerts you have come to rely upon including the Medicare Code Edits (MCE) and ICD-10 MS-DRG edits. Optum360 Edge — Spiral bound with snap tabs. Spiral binding allows the book to lay flat for ease of use and snap in tabs provide faster access to index and tabular sections. What is the difference between the Expert and Professional editions? The Expert Edition is Spiral bound. The Professional edition is not.